The wars of the Ottoman Empire in Europe are also sometimes referred to as the Ottoman Wars or as Turkish Wars, particularly in older, European texts. The Ottoman empire acquired considerable territory in the Balkans, which it ruled for the next 300 years as well as areas of Hungary, Poland and Greece. Ottoman expansion into Europe began as the Christian reconquest of Spain ended, producing what has been described as a "wave like movement" - as Muslims lost territory in the West they gained territory in the East. In Europe, many people saw the series of epic battles as a struggle between two rival faiths, each competing for world supremacy. Conflict was regarded as inevitable. When, on several occasions, the Ottomans reached the gates of Vienna, considered a cultural capital of Europe, it seemed that the devil himself was threatening the very survival of Europe and of its dominant religion. Yet confrontation is not the only option. Borders zones, where most of the clashes between Europe and the Ottomans took place, can also become bridges. That they serve to buttress the two larger communities against each other, or to keep them apart, is not inevitable. Their spaces can be manipulated either way; International relations can be conceived in cooperative instead of in combative terms depending on the choice people make. The fact that great battles took place between the Ottomans and Europeans is a fact of history. However, in an increasingly inter-dependent world with new awareness of a common human responsibility towards each other and towards the planet itself, perpetuating what has described as "amnesia" about moments of convivencia does little to create the conditions for mutual cooperation, respect and co-existence. In remembering the epochal battles, the fact that relations on the ground in the zone of conflict were often harmonious must not be forgotten. After striking a blow to the weakened Byzantine Empire in 1356 (it is disputed that the year may have been 1358 due to a change in the Byzantine calendar), (see Suleyman Pasha) which provided it a basis for operations in Europe, the Ottoman Empire started its westward expansion into the European continent in the middle of the fourteenth century. Its first significant opponent was the young Serbian Empire, which was worn down by a series of campaigns, notably in the Battle of Kosovo in 1389, in which the leaders of both armies were killed, and which gained a central role in Serbian folklore as an epic battle and beginning of bad luck for Serbia. The Ottoman Empire proceeded to conquer the lands of the Second Bulgarian Empire—the Southern half (Thrace) in 1371 (Battle of Maritsa), Sofia in 1382, the then capital Tarnovgrad in 1393, the northern rest after the Battle of Nicopolis in 1396, except Vidin, which fell in 1422; Albania in 1385 (Battle of Savra) and again in 1480; Constantinople in 1453 after the Battle of Varna and Second Battle of Kosovo; Greece in 1460; Serbia by 1459 and (after partial Hungarian reconquest in 1480) again by 1499; Bosnia in 1463 (the Northwestern part only by 1527) and Herzegovina in 1482. The defeat in 1456 at the Siege of Nándorfehérvár (Belgrade) held up Ottoman expansion into Catholic Europe for 70 years, though for one year (1480–1481) the Italian port of Otranto was taken, and in 1493 the Ottoman army successfully raided Croatia and Styria. Battle of Kosovo, Adam Stefanović, oil, 1870. The weaknesses of the fragmented Balkan states following the death of Stefan Uroš IV Dušan of Serbia in 1355 opened wide the door to the conquest of the Balkan Peninsula by the Ottoman Turks. The Balkan states proved no match for those militantly expansive and highly motivated Islamic invaders, who conquered most of the Balkans (except for its extreme northwestern corner) by the mid-sixteenth century. Its conquest was accomplished in two stages, separated by a decade-long interregnum in the early fifteenth century. The first stage spanned the second half of the fourteenth century, during which Thrace, Bulgaria, Macedonia, and Thessaly were acquired outright and Byzantium, Serbia, Wallachia, and much of Morea were reduced to vassal clientage. The second stage, which extended over most of the fifteenth century, accomplished the destruction of Byzantium and the conquest of Constantinople; the total annexation of Serbia and Morea; the outright acquisition of Epiros, Albania, Bosnia, Hercegovina, and much of Croatia; and the imposition of vassal clientage on Moldavia. The Battle of Kosovo (1389) took on particular significance in Balkan memory as an iconic moment of resistance to the Ottoman advance, and although the Serbs were defeated it took another 70 years before Serbia was finally subdued. The Ottomans faced fierce resistance from Albanian highlanders who gathered around their leader, Gjergj Kastrioti Skanderbeg, the offspring of a feudal nobleman, and managed to fend off Ottoman attacks for more than 30 years. The Albanian struggle was one of the two remaining bastions of anti-Ottoman resistance in Eastern Europe after the Battle of Kosovo in 1389. It has been argued that their resilience halted the Ottoman advance along the Eastern flank of the Western Civilization, saving the Italian peninsula from Ottoman conquest. Sultan Mehmet II died in 1481, merely two years after the collapse of the Albanian resistance and one year after he launched the Italian campaign. The Ottoman Empire started sea campaigns as early as 1423, when it waged a seven-year war with the Venetian Republic over maritime control of the Aegean Sea and the Adriatic Sea. The wars with Venice resumed in 1463, until a favorable peace treaty was signed in 1479. In 1480, now no longer hampered by the Venetian fleet, the Ottomans besieged Rhodes and captured Otranto. War with Venice resumed from 1499 to 1503. 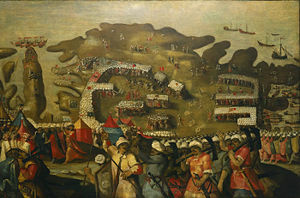 In 1500, a Spanish-Venetian army commanded by Gonzalo de Córdoba took Kefalonia, temporarily stopping the Ottoman offensive on eastern Venetian territories. In 1462, Mehmed II was driven back by Wallachian prince Vlad III Dracula at the Night Attack. However, the latter was imprisoned by Hungarian king Matthias Corvinus. This caused outrage among many influential Hungarian figures and Western admirers of Vlad's success in the battle against the Ottoman Empire (and his early recognition of the threat it posed), including high-ranking members of the Vatican. Because of this, Matthias granted him the status of distinguished prisoner. Eventually, Dracula was freed in late 1475 and was sent with an army of Hungarian and Serbian soldiers to recover Bosnia from the Ottomans. He defeated Ottoman Forces and he gained his first victory against the Ottoman Empire. Upon this victory, Ottoman Forces entered Bogdan in 1476 under the command of Mehmed II. During the war, Vlad was killed and, according to some sources, his head was sent to Constantinople to discourage the other rebellions. In 1482, Bosnia was completely added to Ottoman Lands. Bosnians did not complain about being under Ottoman Sovereignty because there was already a sectarian conflict going in Bosnia, and because Mehmed II did not force Bosnians to convert to Islam. After the Battle of Mohács, only the southwestern part of the Hungarian Kingdom was actually conquered, but the Ottoman campaign continued with small campaigns and major summer invasions (troops returned south of the Balkan Mountains before winter) through the land between 1526 and 1556. In 1529, they mounted their first major attack on the Austrian Habsburg Monarchy (with up to 300,000 troops in earlier accounts, 100,000 according to newer research, attempting to conquer the city of Vienna (Siege of Vienna) (1529), considered an epic moment in the history of Ottoman-European relations. In 1532, another attack on Vienna with 60,000 troops in the main army was held up by the small fort (800 defenders of Kőszeg in western Hungary, fighting a suicidal battle. The invading troops were held up until winter was close and the Habsburg Empire had assembled a force of 80,000 at Vienna. The Ottoman troops returned home through Styria, laying waste to the country. Martin Luther wrote his tract On War Against the Turks in 1529 as a response to the Siege of Vienna. He described Islam as a "patchwork of Jewish, Christian, and heathen beliefs," and saw the work of the devil behind this.. The Turks, however, were God's scourge on European unbelief, "God's rod and the devil's servant." Before fighting the Turks, repentance was a prerequisite.. In the meantime, in 1538, the Ottoman Empire invaded Moldavia. In 1541, another campaign in Hungary took Buda and Pest (which today together form the Hungarian capital Budapest) with a largely bloodless trick: after concluding peace talks with an agreement, troops stormed the open gates of Buda in the night. In retaliation for a failed Austrian counter-attack in 1542, the conquest of the western half of central Hungary was finished in the 1543 campaign that took both the most important royal ex-capital, Székesfehérvár, and the ex-seat of the cardinal, Esztergom. However, the army of 35–40,000 men was not enough for Suleiman to mount another attack on Vienna. A temporary truce was signed between the Habsburg and Ottoman Empires in 1547, which was soon disregarded by the Habsburgs. In the major but moderately successful campaign of 1552, two armies took the eastern part of central Hungary, pushing the borders of the Ottoman Empire to the second (inner) line of northern végvárs (border castles), which Hungary originally built as defense against an expected second Mongol invasion—hence, afterwards, borders on this front changed little. For Hungarians, the 1552 campaign was a series of tragic losses and some heroic (but pyrrhic) victories, which entered folklore—most notably the fall of Drégely (a small fort defended to the last man by just 146 men), and the Siege of Eger. The latter was a major végvár with more than 2000 men, but in poor shape and without outside help. They faced two Ottoman armies (150,000 troops by earlier accounts, 60-75,000 men according to newer research, which were unable to take the castle within five weeks. (The fort was later taken in 1596.) Finally, the 1556 campaign secured Ottoman influence over Transylvania (which had fallen under Habsburg control for a time), while failing to gain any ground on the western front, being tied down in the second (after 1555) unsuccessful siege of the southwestern Hungarian border castle of Szigetvár. The Ottoman Empire conducted another major war against the Habsburgs and their Hungarian territories between 1566 and 1568. The 1566 Battle of Szigetvar, the third siege in which the fort was finally taken, but the aged Sultan died, deterring that year's push for Vienna. Ottoman forces invaded and captured the island of Rhodes in 1522, after two previous failed attempts. The Knights of Rhodes were banished to Malta, which was in turn besieged in 1565. After three months of intense fighting, pitting an Ottoman army of around 65,000 against 2,000 Maltese and 500 Knights, the Ottomans failed to conquer Malta, sustaining very heavy losses, including one of the greatest Muslim corsair generals of the time, Dragut and were repulsed. Had Malta fallen, Sicily and mainland Italy would have fallen under the threat of an Ottoman Invasion. The victory of Malta during this event, which is nowadays known as the Great Siege of Malta, turned the tide and stopped the westward expansion of the Ottoman Empire. It also marked the importance of the Knights of Saint John and their relevant presence in Malta to aid Christendom in its defense against the Muslim onslaught. Malta was the first defeat of two suffered by Suleiman the Magnificent, the greatest Sultan of the Ottomans. The Siege is another iconic moment in the relations between Europe and the Ottomans. The Ottoman naval victories of this period were in the Battle of Preveza (1538) and the Battle of Djerba (1560). The Mediterranean campaign, which lasted from 1570 to 1573, ended with the Ottoman defeat in the Battle of Lepanto (1571), but occupation of Cyprus from 1570. A Holy League of Venice, the Papal States, Spain, the Knights of Saint John in Malta and initially Portugal opposed the Ottoman Empire during this period. Long War (15-Year War with Austria, 1593–1606) ends with status quo. War with Venice 1645–1669 and the conquest of Crete. Polish army advances into Moldavia and is defeated in Battle of Ţuţora. Next year, Poles repel Turkish invasion in Battle of Khotyn. Another conflict starts in 1633 but is soon settled. In 1657, Transylvania, the Eastern part of the former Hungarian Kingdom that after 1526 gained semi-independence while paying tribute to the Ottoman Empire, felt strong enough to attack the Tatars (then the Empire's vassals) to the East, and later the Ottoman Empire itself, that came to the Tatar's defense. The war lasted until 1662, ending in defeat for the Hungarians. The Western part of the Hungarian Kingdom (Partium) was annexed and placed under direct Ottoman control, marking the greatest territorial extent of Ottoman rule in the former Hungarian Kingdom. At the same time, there was another campaign against Austria between 1663 and 1664. However, the Turks were defeated in the Battle of Saint Gotthard on August 1, 1664 by Raimondo Montecuccoli, forcing them to enter the Peace of Vasvár with Austria, which held until 1683. A year after Poland beat back a Tatar invasion, war with Poland 1672–1676, Jan Sobieski distinguishes himself and becomes the King of Poland. The Great Turkish War started in 1683, with a grand invasion force of 140,000 men marching on Vienna, supported by Hungarian noblemen rebelling against Habsburg rule. To stop the invasion, another Holy League was formed, composed of Austria and Poland (notably in the Battle of Vienna), Venetians and the Russian Empire. After winning the Battle of Vienna, the Holy League gained the upper hand, and conducted the re-conquest of Hungary (Buda and Pest were retaken in 1686, the former under the command of a Swiss-born convert to Islam). At the same time, the Venetians launched an expedition into Greece, which conquered the Peloponnese. During the 1687 Venetian attack on the city of Athens (occupied by the Ottomans), the Ottomans turned the ancient Parthenon into an ammunitions storehouse. A Venetian mortar hit the Parthenon, detonating the Ottoman gunpowder stored inside and partially destroying it. The war ended with the Treaty of Karlowitz in 1699. Prince Eugene of Savoy first distinguished himself in 1683 and remained the most important Austrian commander until 1718. Stagnation of the Ottoman Empire (1683-1827) was a period after the territorial expansion of the Empire reached its maximum. During stagnation the empire continued to have military might. The next period would be shaped by the decline of their military power which followed the loss of huge territories. The Battle of Vienna of 1683 marked the greatest extent of the empire in Europe and from a socioeconomic perspective it is accepted as the beginning of the Empire's decline. This period began with the reign of Mustafa II (1695-1703) and ended with that of Mahmud II (1801-1839). Second war with the Russians 1710–1711 near Prut. The Russians were severely beaten but not annihilated. Another war with Austria and Venice started in 1714. Austria conquered the remaining areas of the former Hungarian Kingdom, ending with the Treaty of Passarowitz in 1718. Another war with Russia started in 1735. The Austrians joined in 1737; the war ended in 1739 with the Treaty of Belgrade (with Austria) and the Treaty of Nissa (with Russia). The fourth Russo-Turkish war started in 1768 and ended in 1774 with the Treaty of Kuchuk-Kainarji. Yet another war with Russia and Austria started in 1787; it ended by Austria with the 1791 Treaty of Sistova, and with the 1792 Treaty of Jassy with Russia. An invasion of Egypt and Syria by Napoleon I of France took place in 1798–1799, but ended due to British intervention. Napoleon's capture of Malta on his way to Egypt resulted in the unusual alliance of Russia and the Ottomans resulting in a joint naval expedition to the Ionian Islands. Their successful capture of these islands led to the setting up of the Septinsular Republic. The sixth Russo-Turkish War began in 1806 and ended in 1812 due to Napoleon's invasion of Russia. The First Serbian Uprising took place in 1804, followed by the Second Serbian Uprising in 1815; Serbia was fully liberated by 1877. Moldavian-Wallachian (Romanian) Uprising (starting simultaneously with the Greek Revolution 1821–1824. The Balkans at the end of the nineteenth century, where many epochal conflicts between Europe and the Ottomans took place. The Greek War of Independence, taking place from 1821 to 1832, in which the Great Powers intervened from 1827, including Russia (Seventh Russo–Turkish war, 1828–1829), achieved independence for Greece; the Treaty of Adrianople ended the war. The following wars featured in the period of decline as independence movements, such as the Serbian revolution re-asserted a national identity and consciousness across the Balkans, over and against the Turks, often stressing their Christian legacy. Wars took place with Bosnia 1831–1836, 1836–1837, 1841, with Montenegro 1852–1853 and again in 1858–1859. War with Montenegro, Bosnia and Serbia erupted in 1862. The Cretan Uprising occurred in 1866. From 1853-1856 the Eighth Russo-Turkish war, known as the Crimean War took place, in which the United Kingdom and France joined the war on the side of the Ottoman Empire. Ended with the Treaty of Paris. The failed Bulgarian Rebellion of 1876 encouraged Russia to intervene in the area in the ninth and final Russo–Turkish war of 1877-1878. Romania then declared its independence and waged war on Turkey, joined by Serbians and Bulgarians and finally the Russians. Bosnia was occupied by Austria in 1878. The Russians and the Ottomans signed the Treaty of San Stefano in early 1878. After deliberations at the Congress of Berlin, which was attended by all the Great Powers of the time, the Treaty of Berlin, 1878 recognized several territorial changes. Eastern Rumelia was granted some autonomy in 1878, rebelled in 1885 and joined Bulgaria in 1886. Thessalia ceded to Greece in 1881, but after Greece attacked the Ottoman Empire to help the Second Cretan Uprising in 1897, Greece was defeated in Thessalia. In 1878, when European powers met in Berlin to settle what they saw as the Ottoman problem, namely, that the Empire was hugely indebted to them, one result was ceding Bosnia to Austria-Hungary. While an international commission was entrusted with oversight of Ottoman finances, most of its territory remained intact. The exceptions were: Cyprus, which was ceded to Britain to help her look after her interests in the Suez; Serbia, Montenegro and Bulgaria which were granted independence; and Bosnia which went to Austria-Hungary as a type of protectorate, since they had missed out on the European scramble for Empire). In 1909, Austria-Hungary formally annexed the province. Two Balkan Wars, in 1912 and 1913, involved further action against the Ottoman Empire in Europe. The Balkan League first conquered Macedonia and most of Thrace from the Ottoman Empire, and then fell out over the division of the spoils. This reduced Turkey's possessions in Europe (Rumelia) to their present borders in Eastern Thrace. The Ottoman Empire suffered a defeat in World War I. However, the Empire did not allow the British Navy, under command of Winston Churchill, to pass to Istanbul in the famous Battle of Gallipoli; Turkey temporarily lost most of the rest of what it had left in Europe. After the war, all non-Turkish possessions were either granted independence or placed under League of Nations mandates. Apostolov points out that the extent and length of conflict along what became the European-Ottoman border has no equivalent elsewhere in human history, impacting the lives of "millions of people, and deeply affecting group identities in the zone of contact". He also points out, however, that points out that, where borders exist, and communities mix and mingle and "shade off" into each other, just as Christians and Muslims have historically done in various border-zones such as in the Balkans under Ottoman rule, these spaces have the potential to be either "barriers’ or ‘bridges." Political borders are marked, patrolled and guarded but civilizational ones are more malleable, and they can be imagined either as "a bridge, or a supporting wall in the edifice of world society". The famous bridge in Mostar, Bosnia, built in 1556, destroyed during the War in Bosnia and subsequently rebuilt. Sells describes this bridge as "a symbol of Bosnia’s role in bridging cultures" and suggests that border zones should be re-imagined as places of cooperation not conflict.. The centuries of conflict between the Ottomans and Europe represented by the narrative of the Ottoman wars in Europe has often been characterized as a civilizational clash. The eventual recovery of all Ottoman territory, and the birth of nations based on ancient entities such as the Serbian Empire and the Bulgarian Empire in the nineteenth century, can be regarded as victory for European civilization, itself often identified as Christian. Often, the national epics and stories of the Balkan states depict the Turks as cruel, as destroyers of culture and as having oppressed the non-Muslim population for over three hundred years. Others point out that when Jews fled from persecution elsewhere, usually in the Christian world, they found refuge in the Ottoman Empire. Many settled in the Balkans. The Balkan experience can be differently constructed depending on the agenda; it can demonize Muslims and suggest that Muslims are a threat to European identity, therefore their migration into European space should not be encouraged and those who are already there should be regarded with suspicion. Or, the narrative can be constructed in a way that stresses that Muslims, Christians and Jews often, though not always, enjoyed harmonious relations. According to this narrative, instead of perceiving the Balkans—where so many epochal battles took place—as a buttress against the Muslim world, they can be understood as a bridge, as Sells suggests for Bosnia. In his analysis of the Bosnian conflict, Sells comments that in a world where some sort of geo-political war or conflict between the "increasingly polarized spheres of East and West" seems likely, drawing on its heritage of cross-cultural and inter-religious harmony, "Bosnia-Herzegovina could be a bridge between the majority Christian world and the majority Islamic world." ↑ The End of Europe's Middle Ages - Ottoman Turks Applied History Research Group / University of Calgary Copyright © 1998. Retrieved July 14, 2008. ↑ Ottoman Empire on the Offensive, 1300 - 1600 About.com. Retrieved July 14, 2008. ↑ The Battle of Mohacs, 1526 World History at KMLA (Korean Minjok Leadership Academy). Retrieved July 14, 2008. ↑ The years 1300 and later. All About All Crusades. Retrieved July 14, 2008. ↑ 1683 Siege of Vienna. Rate it All. Retrieved July 14, 2008. ↑ Habsburg-Ottoman War, 1683-1699. World History at KLMA. Retrieved July 14, 2008. ↑ Frank E. Smitha, Decline of Islamic and Ottoman Power. Macro History and World Report. Retrieved July 14, 2008. ↑ Mario Apostolov. 2003. The Christian-Muslim Frontier: a zone of contact, conflict or cooperation. (London, UK; New York, NY: RoutledgeCurzon. ISBN 9780415302814), 25. ↑ Michael Sells. 1998. The Bridge Betrayed: Religion and Genocide in Bosnia. (Berkeley, CA: University of California Press. ISBN 9780585130279), 113. ↑ Stephen O'Shea. 2006. Sea of faith: Islam and Christianity in the medieval Mediterranean world. (New York, NY: Walker. ISBN 9780802714985), 8-9. Apostolov, Mario. 2003. The Christian-Muslim Frontier: a zone of contact, conflict or cooperation. London, UK; New York, NY: RoutledgeCurzon. ISBN 9780415302814. Colin, Imber. 2002. The Ottoman Empire, 1300–1650: The Structure of Power. New York, NY: Palgrave Macmillan. ISBN 0333613864. Inalcik, Halil. 1970. “Emergence of the Ottomans.” in P.M. Holt, Ann K.D. Lambton and Bernard Lewis, eds. The Cambridge History of Islam, vol. 1. Cambridge, MA: Cambridge University Press. ISBN 9780521076012, 263-291. Inalcik, Halil. 1970. “Rise of the Ottoman Empire.” in P.M. Holt, Ann K.D. Lambton and Bernard Lewis eds. The Cambridge History of Islam, vol. 1. Cambridge, MA: Cambridge University Press. ISBN 9780521076012, 295-323. Jelavich, Barbara. 1983. 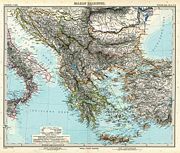 History of the Balkans: Eighteenth and Nineteenth Centuries. Cambridge, MA: Cambridge University Press. ISBN 0521252490. Luther, Martin. "On War Against the Turks," 155-205 in Robert C. Schultz, trans. 1967. Luther's Works, Volume 46 (American Edition). Philadelphia, PA: Fortress Press. ISBN 9780800603465. Matthias, John, and Vladeta Vuckovic. 1988. The Battle of Kosovo. Athens, OH: Swallow Press. ISBN 0804008973. Sells, Michael. 1998. The Bridge Betrayed: Religion and Genocide in Bosnia. Berkeley, CA: University of California Press. ISBN 9780585130279. Vazov, Ivan and Raymond Hansen ed. 2005. Under the Yoke. Sofia, BG: Pax Publishing. ISBN 9549403017. History of "Ottoman wars in Europe"
This page was last modified on 23 November 2008, at 18:03.